Finally it's here - the picture I had been waiting for. It took a while before a colleague sent me this. 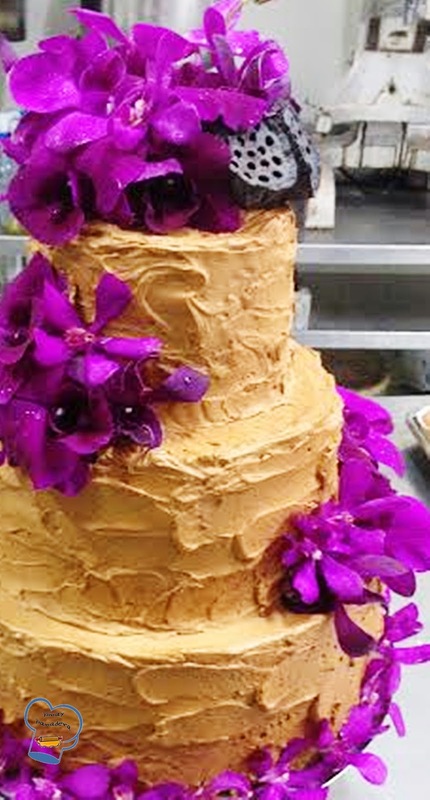 The wedding was on Saturday so I didn't get the chance to take a picture of the cake with the flower accent. But it's never too late to post a nice creation. If you've read my post on fondant-covered chocolate cake in March, you would know that the recipe was adapted from addapinch. I followed the same recipe but made a small tweak once again. Instead of adding freshly ground coffee beans, I opted to use freshly brewed espresso. I reduced the amount of boiling water called for to a half and replaced half with espresso, giving the cake a fuller flavor. To achieve the minty taste, I ditched vanilla and added mint extract. I iced the cake with mint flavored Swiss meringue buttercream. Yummers! The cake was a success. The color was a disappointment. 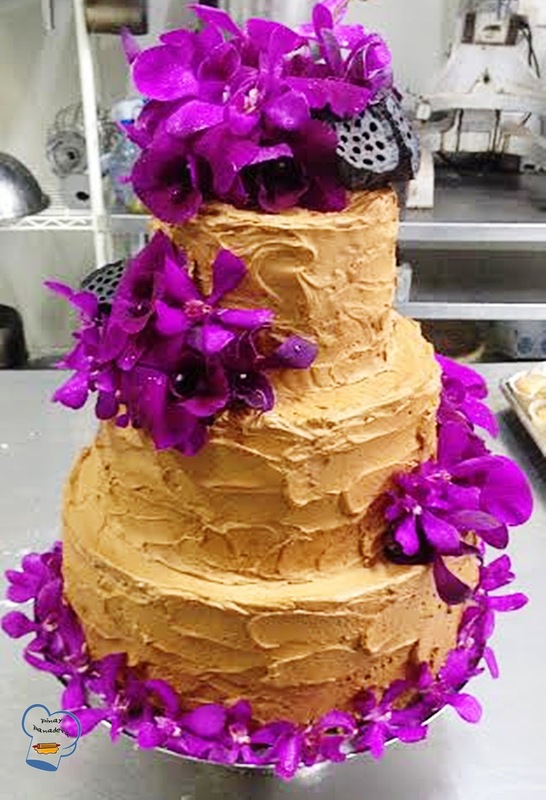 The couple wanted an antique gold cake but this was the closest shade I could come up with. I contacted suppliers for a gold icing color but to no avail. That's the downside of living on an island. Getting the right supply is difficult. I had no other choice but to use the best option I could have. I discovered that a combination of golden yellow and a bit of brown would do the trick, an idea I got from cake forum online.I thought my nightmare ended when I found the solution. As I was coloring the buttercream, my colors ran out. Bummer! It didn't appear to me that a small container of icing color would not be enough to color 2 kilos of buttercream. I was so annoyed. It left me with no choice but to add a bit of cocoa powder just to get a warm tone but this was how it ended up looking. I was more than disappointed, I felt like a failure. My only consolation was that the couple loved the taste! I did the rough icing effect on the cake. Just before the wedding started, the florist did the flower adornment.